Make yourself at home in one of the 32 air-conditioned rooms featuring refrigerators and microwaves. Rooms have private balconies. Complimentary wireless Internet access keeps you connected, and cable programming is available for your entertainment. Private bathrooms with shower/tub combinations feature complimentary toiletries and hair dryers. 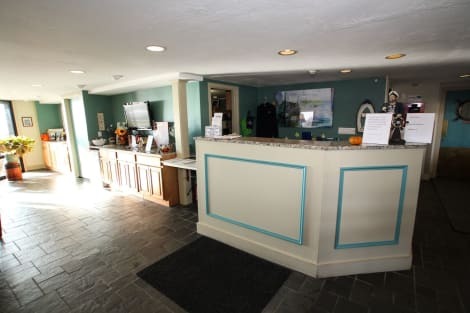 Located in South Yarmouth, Blue Water Resort on the Ocean is by the ocean, a 3-minute drive from Bass River Sports World and 14 minutes from Cape Cod Baseball Hall of Fame. This beach resort is 5.2 mi (8.4 km) from Hyannis Harbor and 6 mi (9.6 km) from John F. Kennedy Memorial. Satisfy your appetite with American cuisine at Irish Village Restaurant, one of the hotel's 2 restaurants. Relax with a refreshing drink at one of the 2 bars/lounges. Breakfast is available for a fee. With a stay at this condo in South Yarmouth, you'll be near the airport, within a 15-minute drive of Hyannis Harbor and Cultural Center of Cape Cod. This beach condo is 6.9 mi (11.2 km) from Cape Codder Water Park and 8.8 mi (14.2 km) from Harwich Port. With a stay at Ocean Mist Beach Hotel & Suites in South Yarmouth, you'll be by the ocean, within a 15-minute drive of Hyannis Harbor and Pirate's Cove Mini Golf. This beach hotel is 6.1 mi (9.8 km) from Cape Codder Water Park and 9.7 mi (15.6 km) from Harwich Port. Make yourself at home in one of the 164 air-conditioned rooms featuring refrigerators and flat-screen televisions. Rooms have private balconies or patios. Complimentary wireless Internet access is available to keep you connected. Partially open bathrooms with shower/tub combinations feature complimentary toiletries and hair dryers. lastminute.com has a fantastic range of hotels in South Yarmouth, with everything from cheap hotels to luxurious five star accommodation available. We like to live up to our last minute name so remember you can book any one of our excellent South Yarmouth hotels up until midnight and stay the same night.